I think these cute little cupcakes may be one of my favorites so far. So sweet for a little girl's birthday party. In a large mixing bowl combine cake mix, eggs, buttermilk and canola oil with an electric mixer. Beat for 2 minutes; occasionally scraping the sides of the bowl. Using a large cookie scoop, drop batter into liners. Bake for 18-20 minutes or until toothpick inserted comes out clean. Place cupcakes on a wire rack to cool. While cupcakes are cooling, make your frosting. Add milk and vanilla extract and beat until light and fluffy, about 4-5 minutes. 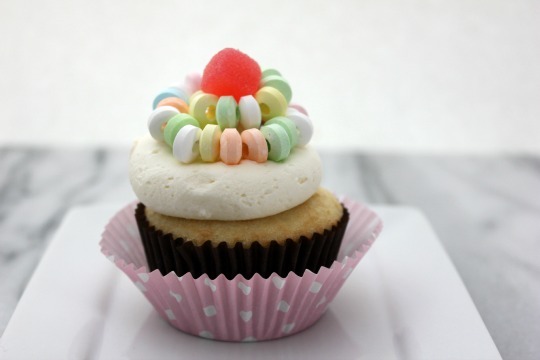 Place frosting into a piping bag and pipe frosting onto cooled cupcakes. Top with a candy bracelet and a Warhead sour chewy cube. It's more fun if you are there too! How cute are these! My daughter would love them! Thanks Erin! I was so happy how they turned out.